Hair: New group gift from Little Bones. called, Schism. It comes in Ink Pot and you can find it in notices. Skin: Group gift #3 from Filthy, 4 in all! Find it in-store and the group is free to join. Jacket: Streamline Jacket in Quartz by Intrepid. This is a free, limited-time only, in-store gift for members of SL Frees & Offers. This is a great group if you love great gifts because a lot of wonderful designers are also part of it and send out gifts to the group regularly. And, It’s free to join! Skirt: New subscribe-o gift from B!ASTA, :CHERISH: Corduroy skirt & knit tops. All you have to do is slap the subscribe-o and it’s yours! The skirt is shown above, it’s mesh with standard sizing options, and the knit tops (not shown) comes in 3 colors. Necklace: 24CT Solid Gold Peace Pendant by Maxi Gossamer. Still out as of right now for the re-opening gift @ Blacklace/Cynful shopping district. Halloween bucket w/candy: Past gift from Olive Juice. 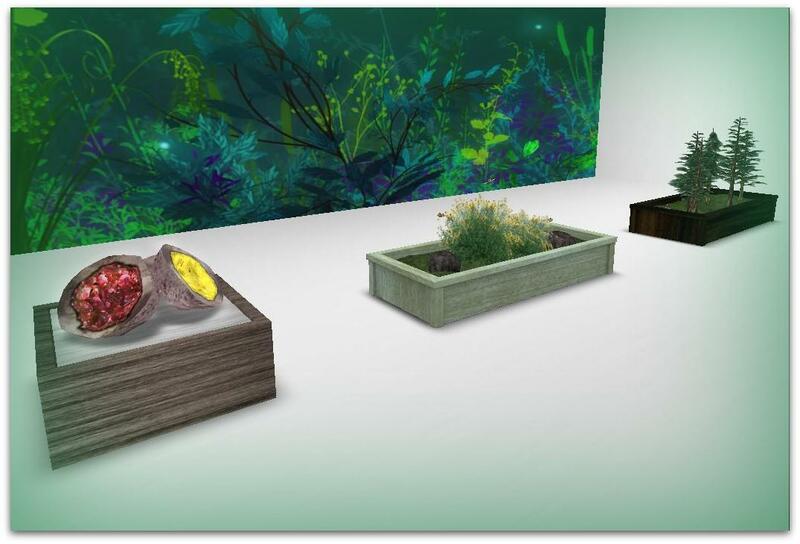 Furniture and decor: [CIRCA] Living, free prize in-store, part of the Autumn Effect Hunt, Please note this hunt ENDS Oct. 15!! There is a hint in-store as you enter. 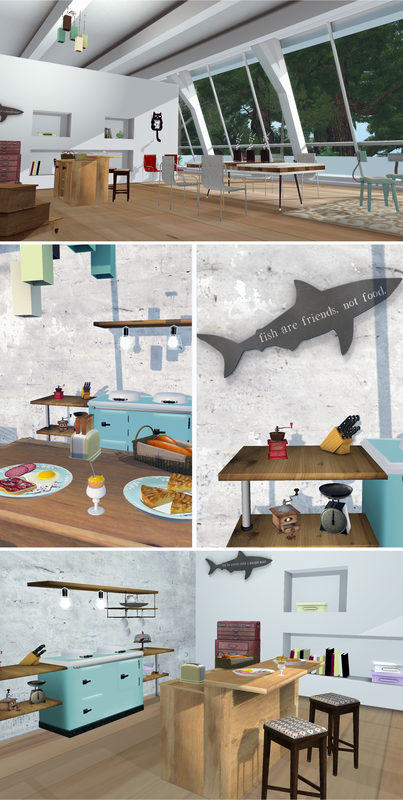 I wanted to feature some of the gifts from the Homestuff hunt before it ends on Sep 2 along with a nice build from Designer Prims I’ve had in inventory for a while. 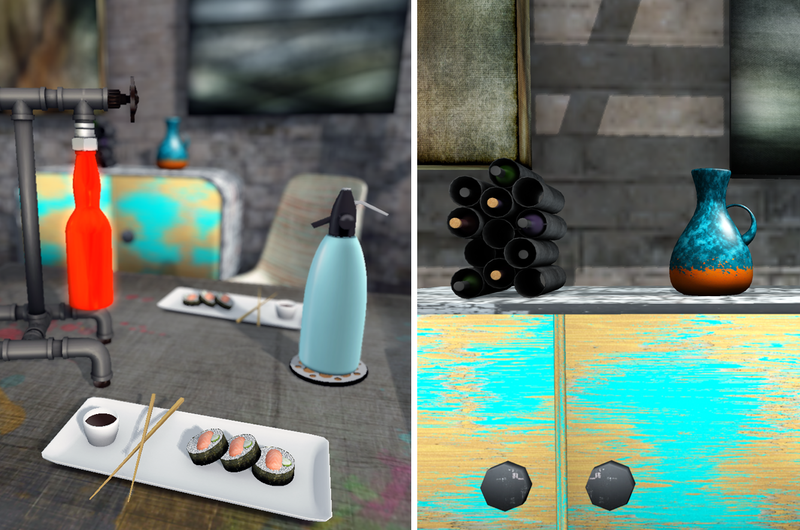 Tekila already blogged Circa‘s Homestuff gift below … here are a few more gifts from that hunt including items from domus, Johadez & Cleo Design. The complete hunt line-up is found here. 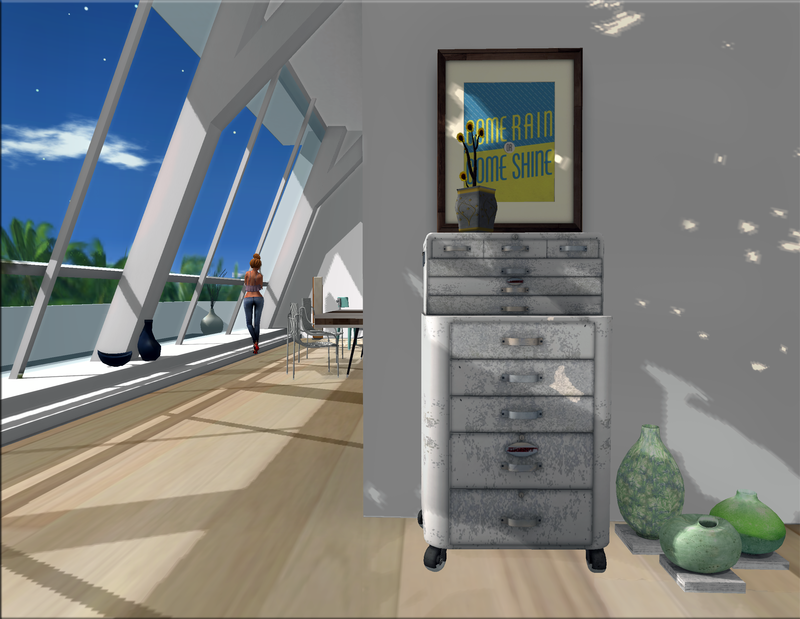 The Designer Prims build is all Mesh with a land impact of just 28 prims including the removable room divider bookcase. It features texture-change walls and floors and in this case full-length windows running the entire frontage with shutters that can be turned on or off by clicking a switch. There are two large living areas, an exterior deck and, as you might guess, the light is great. 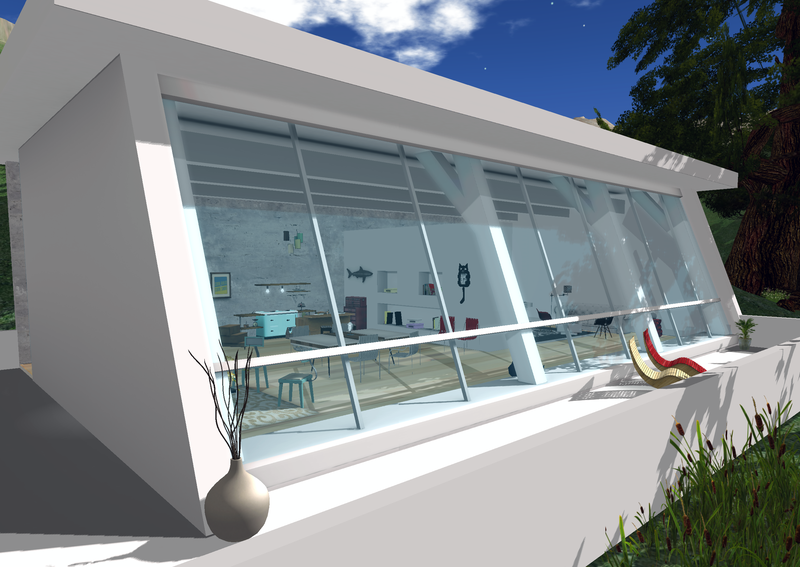 The house is designed for small lots but is still quite roomy and would also work fine as a skyloft. Perhaps best of all, the house is available on marketplace for just 99l. I couldn’t resist throwing a few fashion shots with Astrid into the mix. Clothing includes Liv-Glam, AB and Klubwerk among others. Note there are items here from the 24 Event and Mens Dept – both ending today I believe. 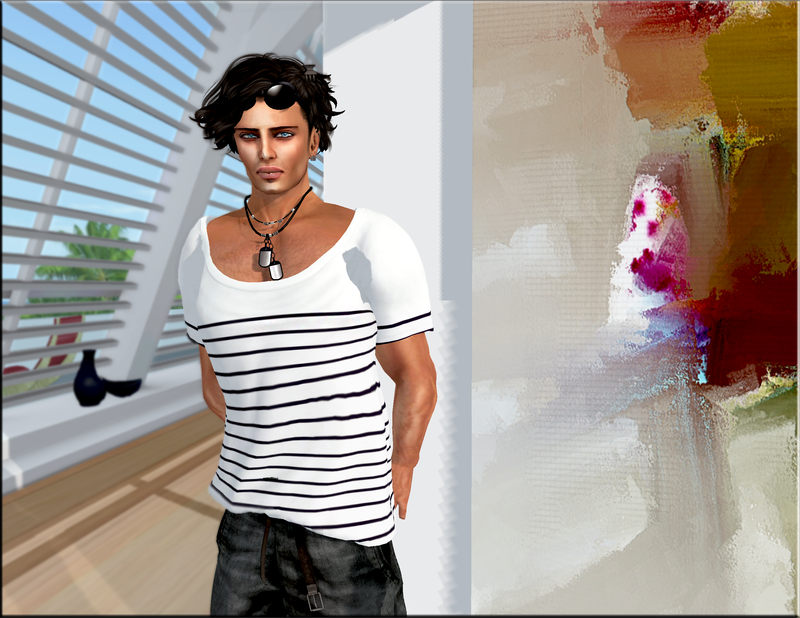 Print: Chez Moi – Print Come Rain Come Shine (45L on Marketplace, MESH). Do you ever feel like you need a little retail therapy? Well, I can relate…….. 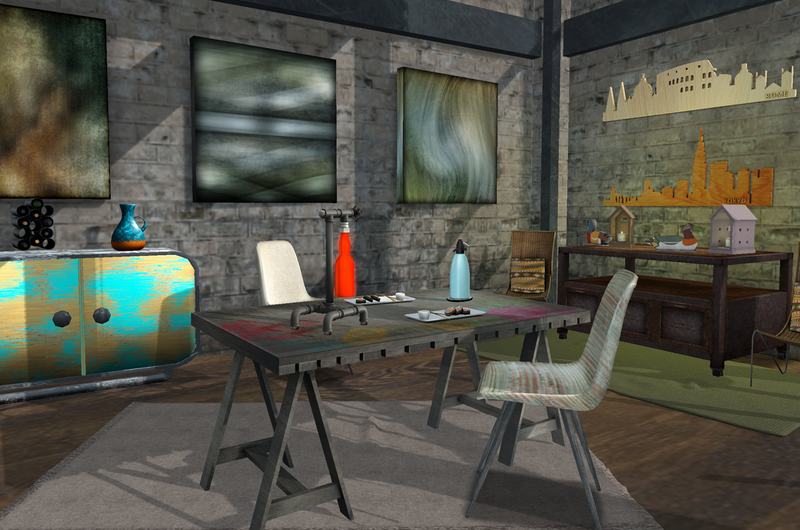 This store is FULL of MESH items for 49L and under, with several being just 1L! They are my best secret on the grid for looking good at a low cost. I got tihs mesh dress and Galaxy S3 phone from there! They even have home stuff for just as much……. Just saying, it’s worth a visit!! It’s almost ALWAYS the right time to have a few martinis. And, with the latest prize from [CIRCA], you can have one on them, any time. A hint: Just Subscribe behind my back, why don’t ya? Just be on the lookout for a Brown Mesh shirt! Not really any freebies in this one, but I know some of you like seeing builds & decor so I thought I’d put this up here. 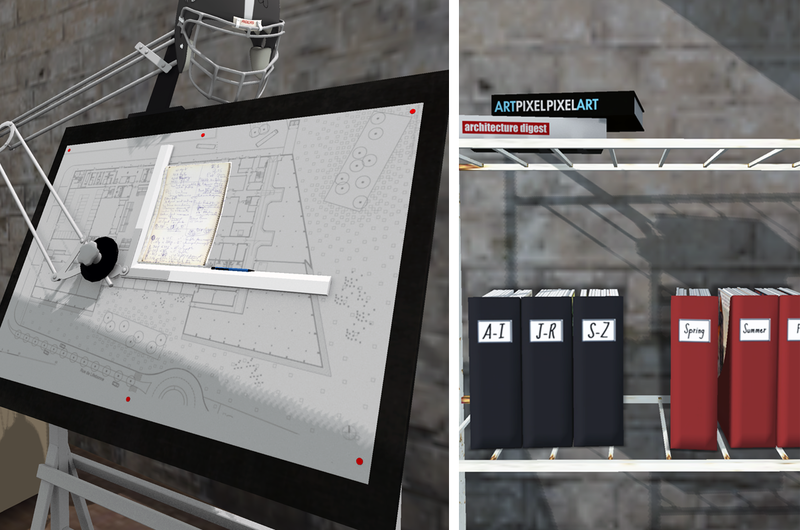 The build is Bauwerk‘s litttle warehouse skybox, which is Mesh (land impact of 44 prims) and features high ceilings, exposed ventilation and monumental florescent style lighting that is fully and individually controllable via a central panel. Notably the intensity of each fixture can be set so you don’t overpower the space with light, as is often the case. The build also makes use of large skylights and full length windows to bring quite a lot of natural light into the box. I’ve tried to decorate as a sort of combined work/home space for an architect or engineer. There are some metal pieces here but also quite a lot of modern style wood sets, particularly from End of Daze, that soften the space quite a bit. Almost all the fashion shown (and the hair from Exile) is from this month’s Mens Dept round, which ends this weekend. If you haven’t been yet, go check it out for lots of nice deals for men (plus some unisex stuff and furniture) before the July rounds rolls in. 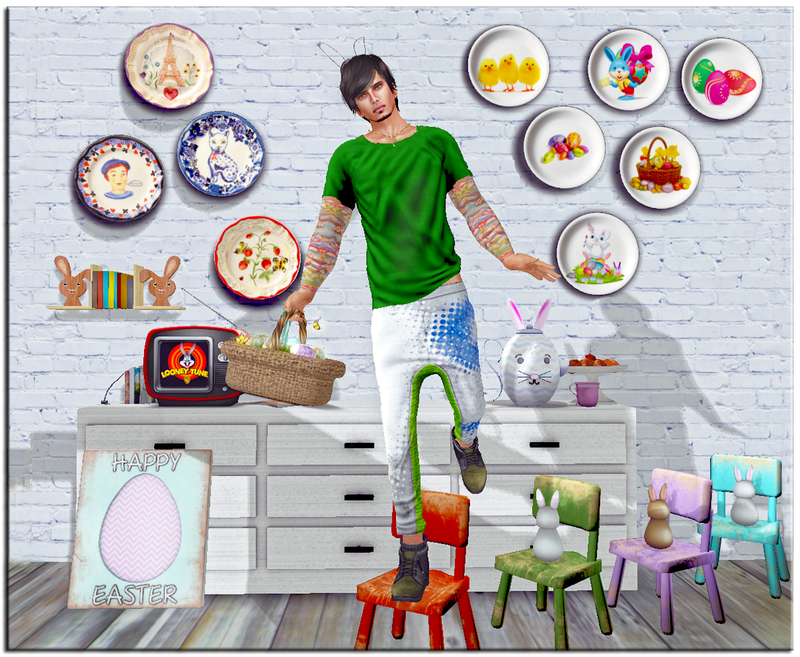 The Nest’s annual Easter Egg hunt started this weekend and there are some wonderful gifts to be had from select stores on SL’s leading home & decor shopping sim (more previews can be see here). 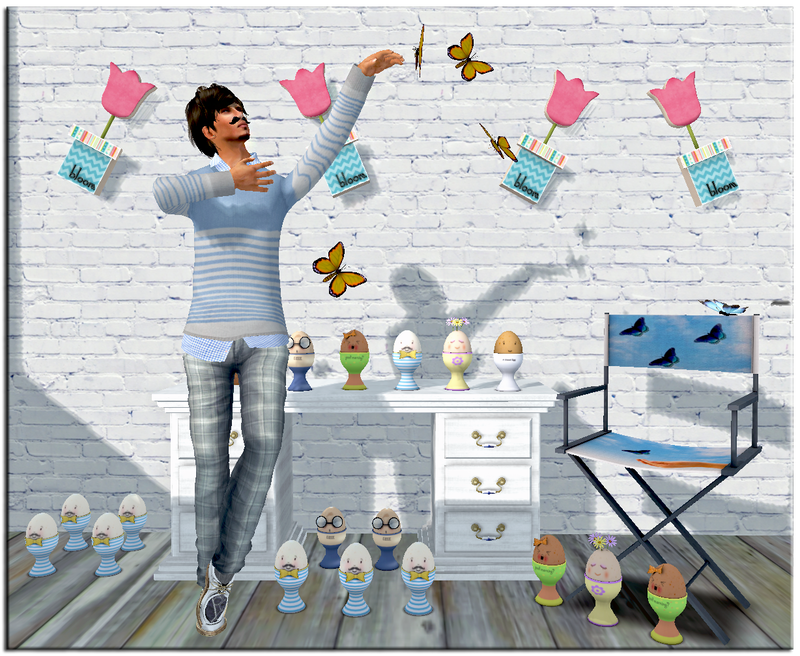 The eggs are hidden throughout the sim, on rooftops and in attics, or scattered in the fields, but they are easily found and there are many of them – most of the participants have put out multiple gifts. 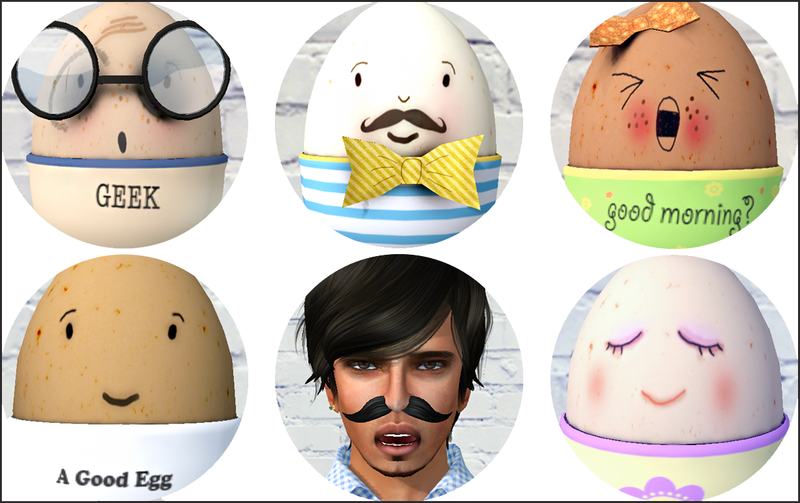 Some of my favorites include the incredibly cute “Eggie” set of mesh figurines from What Next, which range from the dapper Mister Egg to a Geek in goggle glasses or moody Little Miss Monday, who perfectly expresses the Monday-morning blues (there are actually 6 figures to be found – I’ll be going back for my missing egg). Cleo Design’s gifts include a butterfly-laden director’s chair and a colorful set of wall plates that I’ve long needed for my decor and Cheaky Pea’s Mr Whiskers tea set (teapot + cups in a range of colors) should keep you in Earl Grey for days on end.